Jaron Lanier, the world-famous Silicon Valley scientist-pioneer and 'high-tech genius' (Sunday Times) who first alerted us to the dangers of social media, explains why its toxic effects are at the heart of its design, and offers ten simple but devastating arguments for liberating yourself from its hold. Social media is making us sadder, angrier, less empathetic, more fearful, more isolated and more tribal. In recent months it has become horribly clear that social media is not bringing us together - it is tearing us apart. 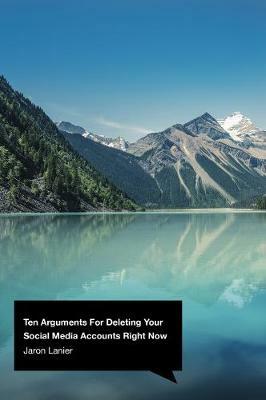 In Ten Arguments For Deleting Your Social Media Accounts Right Now Jaron Lanier draws on his insider's expertise to explain precisely how social media works - by deploying constant surveillance and subconscious manipulation of its users - and why its cruel and dangerous effects are at the heart of its current business model and design. As well as offering ten simple arguments for liberating yourself from its addictive hold, his witty and urgent manifesto outlines a vision for an alternative that provides all the benefits of social media without the harm. So, if you want a happier life, a more just and peaceful world, or merely the chance to think for yourself without being monitored and influenced by the richest corporations in history, then the best thing you can do, for now, is delete your social media accounts - right now. You will almost certainly become a calmer and possibly a nicer person in the process. This is the issue you should read about. And this is the writer you should read. Silicon Valley tech pioneer Jaron Lanier has long been talking about the effects of the network age on what it means to be a person—the way it simplifies the definition of a human being and, perhaps more insidiously, how we change and reduce ourselves to fit into a machine vision of the world. Now, in Ten Arguments, Lanier turns his iron sights on social media; specifically, those advertising-driven platforms like Facebook and Google, whose top-secret algorithms constantly optimise themselves as they condition and modify our behaviour. It sounds like a paranoiac conspiracy thriller, but Lanier is pretty level-headed as he reasons his way through the (negative) impact of social media—on free will, compassion, honesty, politics and more. Happily, he’s also got an idea of how things might be different; he’s not anti-tech, he just thinks we need to do things differently—and fast.